The Selmer AS42 Alto Saxophone marks a first ever collaboration between Henri Selmer Paris and Selmer USA on an entry-level professional saxophone. Featuring a fully ribbed body construction, Pisoni pro leather pads with metal resonators, blued steel springs and hand engraving - the body for the AS42 is ready for the advancing player, but it also comes with a neck designed and manufactured by Selmer Paris for this instrument, as well as a mouthpiece from Selmer Paris specially made for the advancing player. 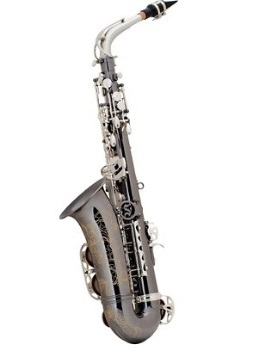 This makes the AS42 the most unique instrument in its class and price range, and the only one that can boast a genuine Henri Selmer Paris neck and mouthpiece. Yellow brass, fully ribbed construction, hand engraved, genuine BAM case, genuine Selmer Paris neck and mouthpiece, Pisoni pro pads with metal resonators, High F# key, rocking table mechanism, adjustment screws. Black Nickel finish.